I can’t seem to resist bringing an abstract aspect to my paintings, so here you have my abstract-ish pear, and I hope you enjoy. I went into this monthly challenge a bit on the nervous side, as I had got used to the warm wading pool of acrylic work, where it is oh so easy to cover up mistakes. Not as easy in watercolor, but I’m going with the flow so far. I sketched this little pear from life, and it was actually leaning toward me on the table, as sometimes pears do, but looking at this again from a compositional standpoint, I kind of wish I had drawn him a bit flatter. He definitely wasn’t standing on one tippy-toe, as he appears to be here. hehe. I really enjoyed the wet into wet aspects of this painting, both in the background and in the colors of the pear itself. It’s why I fell in love with watercolor nearly two years ago now, and I love to be able to incorporate it into my work in a realistic sense. When it works, which I think it did here, in the pear itself anyhow. I found out M. Graham permanent green and azo yellow combine to make that beautiful light green that I really love about this little painting. Winsor red and Winsor orange helped me out in the base of the pear, along with a little M. Graham burnt sienna. I believe Graham Prussian blue and phthalo blue played the background roles. I don’t want to jinx myself, but I’m surprisingly enjoying this watercolor excursion so far. Blick is offering free shipping on orders of $59 or more through midnight Central time on July 4! I love the pear, Laura!! Thanks for all the tips on watercolors. I’m looking forward to your daily shares! What a perfectly precious pear!! Thanks, Beverly. Making the journey, huh? Trying to warm up to lady WC. So much to love here! The colors of the pear… Pow… The background wash… Wow… The drip effect of the table… Pazzow… The shape of the pear… Kapow! Beautiful Loo! Lol I almost feel like I just watched some fireworks, Jodi, great sound effects! 💜 Glad you enjoyed. I am trying to power through this month. Trying to shut up that voice inside reminding me I’m no good at WC. Hehe. Thanks for your encouragement. 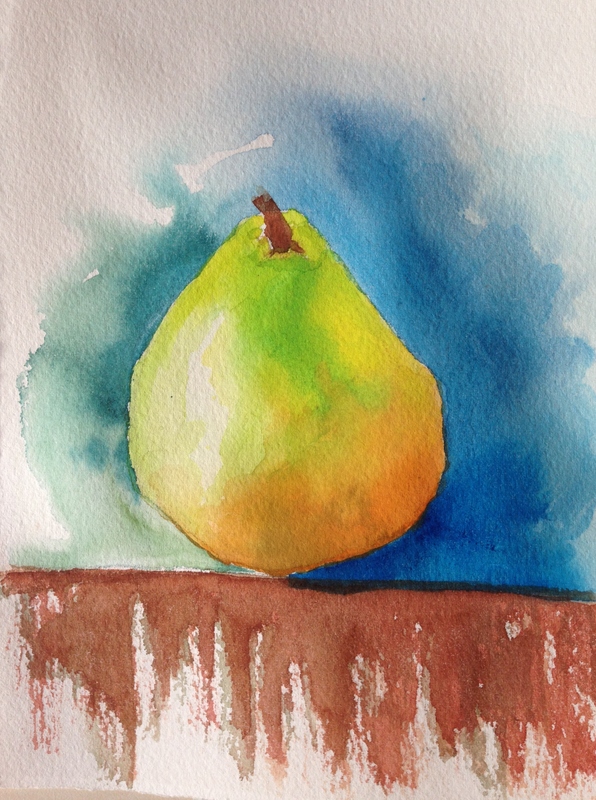 Wonderful melding of realism and abstract in your pear painting, Laura. Happy World Watercolor Month to you! I must work on my Day 3 watercolor this morning. Cheers! Loving the loose feeling in this sweet pear, Laura! Carrie, this WWM is a real challenge for me. Just trying to create something people won’t laugh at daily lol. Hey maybe they are coming by just for the laughs, and that’s all good too. I’m enjoying what you’re doing too! Oh Laura, you do not know how stressful this challenge is to me. But I wanted to learn but very lazy to do my own homework. I am playing by ear and winging it on my own. Oh, I dont know. I just want to have fun. Oh that attitude will kill someone like me who loves perfection and detail and had accepted that stress comes with making art. But you are absolutely right! No plans and just watch where the pigments and water take us. Pure bliss! I think your pear is perfect Laura. It’s a very joyful painting! Absolutely it is. Especially if we’re talking about a pear. How exciting can they be? Well, I’ve seen them done really well. So I shouldn’t say that. But not by someone at my level maybe. So much. You know. Love what you do and do what you love. I think it always shows. I do love a good pair! Another here who’s very much enjoying you working in the abstracts. This looks particularly juicy – mmm! Thank you so much, Margaret, I needed your uplifting and encouraging words today! Much appreciated, buddy. My post is confusing, I painted this one on 140# but I have tried 300# too and will be painting with that also this month. I just love it! Yes, it is expensive at around $11 a sheet, but it seems every surface is expensive and I guess you get what you pay for, huh? I am drinking in your nuggets and tips and info you’ve learned about the “beast”. I do like that name, it suits her just fine! I agree, paintings turn out much better with that “ooh, what’s gonna happen now” kind of anticipation. I am working on it. It is very much a mind game, I am learning. I also love that there is no pressure anymore re: wasting paper, as I can easily gesso (or mostly gess0) over it and then do wc or do acrylic or do both! So it is no worries and full speed ahead! Thank you, Margaret. I really needed that. (((((M))))) ❤ I hope you are enjoying your weekend so far. I am learning to turn the paper over and re-using it or like you say gesso it. I have a few papers with paintings that now I can probably gesso it and re-use them for other paintings, other mediums….what an idea! I have been throwing them in the trash, no more. So far my weekend has been nice and relaxing, well….today has been. Yesterday I made a run over to my framer to get a pastel framed. Have a wonderful 4th of July! Beautiful ripeness to this luscious pear Laura. Tierney, honestly if you check out The Frugal Crafter on YouTube, Peter Sheeler, The Mind of Watercolor, just to name a few, you will quickly see that it really doesn’t take much at all to get started. I have never taken a class. I have watched lots of lessons on http://www.artistsnetwork.com though and they are just wonderful. You have a wonderful color sense, I can see you going crazy painting patchwork abstract quilts. You would be a star, I promise you! Wow, I thought you took classes! Now I am even more impressed 🙂 thanks for the tips! Thanks Laura for all these great ideas and resources! Very nice! You are getting the hang of the watercolor beast. Thanks so much, Jill! I do love that light green. It’s so springy and happy! It’s a great pear Laura! I’m happy to see using watercolor this month. But the end of the month I hope you will be great friends with it. Arches is my fav watercolor paper but I have yet to try 300#. So I am in envy until I get back to Tucson to buy some. I hope so too, Teri. Yes, the 300# is wonderful stuff. It really helps my work look better. This is on 140# but this buckled a bit and I haven’t seen 300 buckle yet. If it does, it’s so minor, that it doesn’t affect you at all while you’re painting. Truly dreamy! If you find it for less than what Blick carries it for, I’d love to hear about it! It is worth its weight in gold. ❤ Hope you enjoy & Happy Fourth! I won’t be back to Tucson until September but will definitely let you know. A pretty pear, Laura! Love the added background colors too! Beautiful pear Laura; it really pops out and nice colors! that is one beautiful pear! Thanks, Ann! This one was fun. Oh, watercolor is a tough mistress! Beautiful colors Laura. Love your pear! Stunning Colours and it jumps off the page Laura well done. Fantastic looking pear! Love how the colors are so vibrant and yet they mingle so nicely. Brilliant and beautiful painting! Thanks so much! This one was lots of fun!